Photo by Kake Pugh. Image used under Creative Commons license. 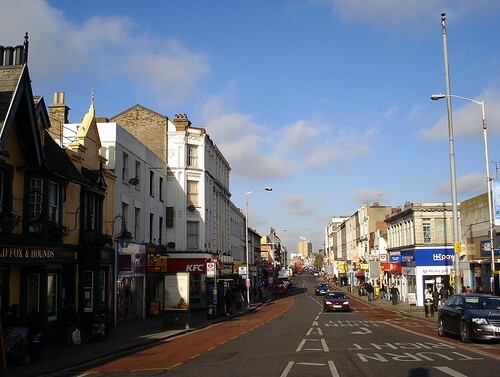 The London Road area of West Croydon is a vibrant and unique business community with a range of shops highlighting the diverse and multicultural nature of our town. The grocery stores, restaurants, beauty salons and other businesses give the area a distinct feel and character. Kake’s series of excellent historical articles about the road offers a sample of what it has to offer. The area, however, has been in gradual decline for well over a decade now, with the buildings and public realm looking tired, and there being a perception of increased crime and anti social behaviour. The riots of 2011 were certainly a huge blow to the area with businesses being badly affected. However things are now going to change, thanks to significant investment coming into the area from both the council and the Mayor of London. The money being spent on the physical infrastructure, local businesses, and communities will transform the area as never before. Close to £5 million is going to be spent on the West Croydon transport interchange. This will transform the public realm around West Croydon station, and will include a wider tram stop, more space for pedestrians, a bright and cheery arrival place outside West Croydon Station and lower London Road, and better connections to the Whitgift Centre as well as the London Road shops. On top of this, a further £3 million will be spent on public realm improvements along London Road extending up to Campbell Road. These will include repairing, paving, and de-cluttering the heavily congested footpaths, as well as rationalising advertising. We will also invest in shop front enhancements to support London Road’s small businesses and diverse culture. Taken together these projects will transform the physical infrastructure on London Road, making it a far more pleasant experience for visitors, shoppers, and commuters, at the same time maintaining the unique character of the area. But the investment will not be in infrastructure alone. It is recognised that businesses have been suffering since the riots, and hence we have put together measures to support them and help them recover, totalling £1.5 million. This will include an Enterprise Hub based in London Road, which will provide support services and training to existing and new businesses in the area. Businesses seeking support and advice on legal issues, accounting, marketing, payroll and staff matters, funding sources, product development, etc. will find help at this Hub. These services provide the tools for new and existing businesses to grow and succeed. We are often told that crime and antisocial behaviour blight the area. However, things are soon to improve as Mayor Boris Johnson recently announced an extra 117 police officers will be deployed in Croydon. A bulk of these officers will be dedicated to neighbourhood policing, and will be on hand to deal with the problems on London Road. We are also lobbying the Mayor to ensure that there is a permanent police presence on London Road. The council will soon be appointing a safety and clean streets co-ordinator, exclusively for London Road. This dedicated person will walk the London Road on a daily basis, ensuring the area is clean and safe, and will deal with issues like street cleaning, litter, fly tipping, anti-social behaviour, and petty crime. He or she will maintain close links with local businesses, ensuring that the issues they face are dealt with in a timely manner. This person will also co-ordinate the Croydon Safer Radio scheme, which will give local businesses direct contact to the council’s CCTV control room to report crimes and suspicious behaviour. Given the importance of creating jobs for people in the area, especially young people, we will be setting up a local employment creation project. Businesses will be provided employment grants (wage subsidies) to employ individuals identified under this programme. The subsidies will be for 12 months, with the aim that at the end of the period the businesses will feel confident enough to offer this person a full time job. The project will also provide training and employability skills and on-going in-work support, advice, and guidance to those taking part. This will help local workless residents to access these job opportunities and improve their long term employment prospects. But London Road and West Croydon is not just about businesses, it is about communities and residents as well. To help us better support them we are undertaking an independent audit of social and economic programme activity currently being delivered in the north of the borough, to enable the council to prioritise programme expenditure that is making the biggest difference to key outcomes i.e. jobs, good education, and health. Vidhi Mohan was born in India and has lived in Croydon since 2000. He works for one of the UK's largest engineering companies as a consultant with the transport industry, advising both public and private sector clients on the feasibility, funding and implementation of transport schemes. A Conservative councillor since 2005, Vidhi is currently the cabinet member for Communities and Economic Development. He is a governor at Park Hill Infant School and was previously on the board of Croydon College. In his spare time Vidhi enjoys watching and playing sport, especially cricket. The Croydon Citizen is in danger of losing all credibility by publishing Tory Council spin of the type contained in this article. Cllr Mohan says that the crime and anti-social behaviour position will be improved by the announcement of “an extra 117 police officers” when he knows very well that this only restores recent cuts and brings the force up to the (inadequate) level which applied at the time of the riots. Also if the current plans go ahead there will be no police stations left open in Croydon North. The recommendation of the Riots Inquiry that there should be a new station in London Road has been ignored. Cllr Mohan also omits to mention that most of the money allocated to Croydon by the London Mayor, following the riots, is to be spent in and around the Whitgift Shopping Centre (which was protected and relatively unscathed during the riots) and not in London Road at all, although London Road was the area worst affected by the riots. The Whitgift Centre just happens to be in Fairfield Ward, which Cllr Mohan represents. Further money has been devoted to schemes between the Whitgift Centre and East Croydon Station, again in Fairfield Ward. It is also extraordinary that Cllr Mohan writes about London Road without mentioning the plight of the many people whose homes or businesses were damaged or destroyed during the riots, and who are still waiting for compensation and assistance nearly 20 months on. The current edition of the Croydon Advertiser tells some of these people’s stories. The Council should be devoting resources to breaking through the bureaucracy and helping these people. There will be a fair amount of money spent on London Road as well, though. I’m particularly looking forward to the public realm improvements. challenged”. With respect (and as a fellow contributor to the Citizen), I’m not sure how this article was deemed to be fit for purpose by the usually sharp editorial team. I read the Citizen’s byline as applying to contributors too — if one writes an article on here, one can expect to be challenged by commenters. I was sad to see that the author of the previous article by a Croydon councillor didn’t respond to any of the comments on his article, and I hope the present author will do better. Quite right, Kake. The Citizen is not a one-way propaganda outlet but an opportunity for people to comment on and challenge the way its contributors present the issues facing Croydon. I agree above all with Sean’s point however – Croydon councillors of course have every right to write pieces for the Citizen. It would simply be foolish for them not to then engage with its readers in the way that our other contributors find so useful, such as you, Andy Dickinson or Sean himself. I’m personally hopeful that more elected representatives will express an interest in writing for the Citizen soon, particularly some from other parties. It would be very interesting (and, forgive the corporate-speak: ‘very Citizen’) to have articles on similar topics written by people from varying political organisations and commented on, discussed and shared by the wider Citizen readership. We’ve had similar kinds of debates between private individuals (such as Tom Lickley’s response to James Naylor’s article about Westfield), and as a bit of a politics geek I would be really excited to see, say, a Labour-penned response to this piece or to another issue. While I understand the comments of David White and bieneosa there is no reason why Tory Councillors should not be able to contribute to Croydon Citizen, as long as it is clear that they are such. Public debate without the Tweedledum/dee nature of normal Party politics such as at Monday’s emergency Council meeting on the Libraries, is healthy. What Cllr Mohan has written can be used to measure Council delivery of the package, and he can be held to account for any failures. One of the most interesting elements of the package is the idea of a multii function street co-ordinator, a post I have argued for elsewhere in the past . What appears to be missing is something that worked very well in Wandsworth in the 1970s, a multi-disciplinary team from different departments based in Housing Action Areas and accountable to a joint Committee of Councillors and residents. That team could combine the Economic Hub staff, the street co-ordinator, a welfare/housing rights worker, an environmental health officer and a environmental action worker. Applying the principle on the London Rd would mean a Committee on which local businesses should also be represented. An independent audit of social and economic programme activity in North Croydon is a welcome initiative. My previous reflections on the future of Croydon economic development can be seen at http://historyandsocialaction.blogspot.co.uk/2012/10/a-local-economic-strategy-for-croydon.html. where I saw the article had been published on Croydon Conservative’s website prior to being posted on the Citizen’s website. maintain these comments regardless of the political party involved. issue. I also hope it is the last we see of this type of article submission, if the Citizen wants to stay true to its original purpose. I hadn’t realised the article was previously published elsewhere — this is against the Citizen’s contributor guidelines, so yes, it does seem like there was an editorial mistake made here. However, I don’t think the venue it was originally published in makes any difference at all. Suppose that its appearance on the Citizen was its first ever publication. It would be exactly the same article, using the same words and coming from the same perspective — but your criticism of the editorial team’s integrity and lack of bias would have no grounds. If the article would be acceptable under those circumstances, surely the only sin committed by the Citizen’s editors is that of failing to ensure that the author honoured their guidelines on simultaneous publication. In any case, I’m still very interested in hearing Vidhi’s response to David’s points — which, I note, couldn’t have been made on the Croydon Conservatives website as it offers no commenting facilities. I agree with you Bieneosa. Members of the Cabinet have enough organs to announce their views: the quarterly magazine produced by the Council and delivered to every household; their party political website and the council-funded press outfit. I personally think the Citizen should be careful that it is not seen as a mouthpiece of the Conservative administration (and this is from a supporter of the website). The Citizen has made it very clear that any and all people are allowed to write for them as long as they declare their interests. James has rightly clarified his editorial position below which is incredibly reasonable. That Conservatives (and Green’s/Labour activists and other non-politico’s) have chosen to contribute to this community site should be applauded. James clarified the events that led to this article being published, therefore as much as I love my debates with Bieneosa on this specific issue her argument is invalidated. Claiming that it was a repurposed piece is inaccurate as Kake rightly points out: ‘Suppose that its appearance on the Citizen was its first ever publication. It would be exactly the same article, using the same words and coming from the same perspective — but your criticism of the editorial team’s integrity and lack of bias would have no grounds’. Very well said. Ultimately some people will agree with Vidhi, some will disagree. Others will be indifferent. I see no problem any of that occuring on the Citizen but that is entirely in the hands of the editors. But one thing to consider: it is highly hypocritical to argue that Councillors need to engage more online and then to slam them (for whatever reason) when they make the effort to do so. It’s hardly encouraging for them is it? As an aside, surely it would be of benefit for Vidhi to respond to comments too? After all, it is Vidhi who has taken the time to write and submit the article; and whilst it is always a pleasure to debate with you too, it would make sense for us to hear straight from the horse’s mouth. You’re mischaracterising my comment here. My point was not that this isn’t a repurposed piece — what I said was that the only thing I see the Citizen as having done wrong is the fact that it does appear to be a repurposed piece. I agree that councillors have more than enough places to express their views already, so if Vidhi decides not to respond to the comments made here, then I would start wondering why he wants to publish on the Citizen. However, it’s not been all that long since his article went up, and I hope he’ll join in the discussion when he gets a chance. Paul, as a card-carrying Labour Party member and regular contributor to the Citizen, I cannot say I agree with your view that people should be disqualified from writing for the Croydon Citizen because of party allegiance (not least because if that were instituted as a rule, I and many other contributors would have to stop writing for it!). On the contrary, I would like to see more elected officials from all parties writing for the Citizen. As Mario said, as a society we always seem to demand our elected officials engage with us – it seems churlish to criticise Councillor Mohan’s attempts to present his ideas in a public forum rather than take the opportunity (as others in this comment thread have done) to criticise or question the ideas themselves. In this vein, I would like to echo Kake in that it would be great to see what Vidhi has to say in response to the comments here. I’m glad you support the Citizen, but once again, I can’t say I agree with you that anyone should be disqualified from contributing because of political involvement, or indeed involvement with any organisation. Thank you so much for all your comments on the piece so far – I’m personally very cheered by this. It’s great to know there is such an active, intelligent community on this site that want to debate these issues . This piece has clearly caused controversy – involving some accusations that the Citizen has been, in some way, compromised by it. As a result, I think it’s valuable for me to answer some of these concerns here, including addressing some commenters directly. As this is a long comment, I’ve broken into parts for easier digestion. Bieneosa – I’ve taken the liberty of answering some of your tweets here to as I will be not answering them on twitter as the format is not fit for the task. I hope that’s ok with you. Bieneosa – You made the claim that his copied and pasted from the local Conservatives’ website. While this is a completely understandable claim to make based on what you’ve seen – it is unfortunately, an incorrect supposition. This article was always written as a post by Vidhi for the Citizen first and would have normally been subject to our normal 7-day re-blogging policy. However, after we sat on it for a long time the Conservatives took the decision on their own to publish it themselves, before we were able to publish. It was at this point we took the decision – one which I now regret – to publish it anyway. In a gesture of good faith to Vidhi that we had been exceptionally slow in publishing his work, we veered from our usual hard-line. This gave the unfortunate impression that it was a copy. As Kake says, it is an editorial mistake on our part but not an instance of “copy and paste”. David White & Bieneosa – You raised that issue publication of this kind of work may have compromised us and raised questions about editorial bias. However, I think even to make this suggestion in response to this piece must involve some misunderstanding of what the Citizen is. The Citizen is not a neutral publication. It is a plural publication -The difference between these two things is very important. The publication itself has not expressed a view here. Instead, we have invited Vidhi to put his view of the progress in regeneration of London Road. As Sean says, as a fellow citizen of Croydon he has just as much right to contribute to this paper as anyone else . And this remains true even if you think the picture picture he paints is impossibly rosy, positive and unrealistic – even if you believe its propaganda. It is not our duty to force him to become more balanced in his critique – or edit him to present a more balanced perspective. We are not trying to put forward a neutral or independent perspective; which is what a neutral media organisation like the BBC are bound to do in the hopes of giving you “just the facts”. But we believe something very different. We were born post-modern. We think that individual bias is impossible to avoid – it is part of who we are, and that all attempts to achieve that kind of ‘balance’ – and all attempts to serve you “the truth” are flawed. Instead we try to bring as many (often mutually exclusive) perspectives as possible together so that the reader can make their own mind up about what to believe. We believe that is through dialog, and the sharing of these perspectives that progress occurs. This is what “many truths – many answers” really means and it is probably more radical than many readers realise. That is whye publish biographies. Not for vanity, or helping promote the authors but for the very practical purpose of transparency; which, as Sean observes, is crucial to the concept. We want to inform your judgement by letting you know what the potential bias, motivations and goals of writers might be. Vidhi’s, transparent bio, is a case in point :“A Conservative Councillor since 2005, Vidhi is currently the Cabinet Member for Communities and Economic Development.” Knowing this information it’s reasonable to assume that his review of their activity would be glowing. You might think this is a good reason to be sceptical of some of what he says. But I would go even further – I would encourage readers to maintain a healthy scepticism about everything they read on the Citizen. Which is exactly what has happened here and elsewhere; especially when authors have posted on controversial topics like public spending. This is a sign that the project is working. Far from being a cheer-rag, or losing its ways, it is becoming the place where Croydonians of many different life experiences come to tackle the borough’s serious problems head-on. There is another failure on our part here though that we must face up to. We don’t often yet have a sufficient scale of contributors to ensure those multiple perspectives are present on every issue. But this vision is something we’d very much like to achieve. This article is a case in point: As soon as someone offers to write a detailed piece about the plight of London Road and its people – or the failure of the council to address their needs now and in the future, we would prepare it for publishing in a heartbeat. 3) We have made some mistakes here – “could do better” would be very fair assessment here. This is a very useful point to talk about the mistakes we did make here.On behalf of the team we wholeheartedly apologise for these. Our considerable mistake over choosing to publish content that wasn’t fresh aside, and our failure to be sufficiently organised, we did publish something here that wasn’t up to our normally high standards. The comparatively few social shares for this piece stands testament to its comparatively lukewarm reception – it is certainly not one of our corkers. But in fairness to Vidhi – this may be because this article is meant to be published in two parts. The first was to set-out the situation as it stands and the second was meant to explore the themes in more detail from his perspective. Unfortunately, what we have here is, in isolation, a bit disappointing. Bienesoa made the remark that it read “like a brochure” on twitter. I think to see this on its own, it does: Vidhi does not go into as much analysis here as he could in this portion of his article or use the opening to really explore the issues, instead he focuses on a list of things the council say they will do. Our hope is that the second section will prove more engaging and challenging. The second section tries to explore the roots causes of issues from his point of view and seeks to tackle some of the specific, very serious objections of the kind David White mentions; including, as it happens one of his points head-on. Of course how adequately the piece achieves that will be for our community to decide when we publish the second piece. We are always striving to go further in what we do, but inevitably we are going to make mistakes. But I would say this: While I am very excited by our progress, it’s worth restating here that we’ve only been going 4 months. We need the support of all of the people who’ve taken the time to comment here as we get better at what we do. And while I am proud to say we are a pretty professional operation all round, it’s worth remembering that this is a project run by a small group of people without journalism qualifications, entirely in their spare time around some pretty demanding jobs: so we’ve probably still got lots of mistakes to make and learning to do! I hope this answers some of the concerns of our readers and apologies again for its epic length. As always, we would encourage them to make their views known to us on this. We always like to here new suggestions – it is your feedback that makes us better. The highest expression of this is writing a piece in response what is already on the site. Once we can really begin sharing very different but informed, challenging articles, the vision of the site to provide “many truths” and “many answers” will be truly realized. A well-reasoned and thought out comment James. Whilst I may not agree with every angle, it’s incredibly important that all readers understand your pluralist editorial stance and try to avoid slinging ad hominem political mud at The Citizen. A strong citizen journalist culture in Croydon must be protected, your comment certainly sets that record straight. For a blog that’s been going only four months you should be commended and not condemned – keep up the good work! Mario, I’m unsure as to why you have labelled my comments, which I am entitled to make, as “ad hominem political mud”. I’m not batting for any political party and any comments that I have made have been done so in my capacity as a contributor and as a PR professional. And finally, as a contributor, I have no interest in “condemning” the Citizen. I have provided what I see as being constructive criticism, and it’s good to see that James has acknowledged that some mistakes have been made, particularly in relation to the decision to publish Vidhi’s article. I wasn’t referring to you Bieneosa. Your political credentials are not under question from me at all. As a fellow PR professional I entirely understand and welcome your constructive criticism. Though your critique of Vidhi’s writing style as sounding like a ‘brochure’ does seem a tad unfair – we aren’t all pro’s and we can’t all write in the same articulate and witty way. Accepting a broad church of abilities as well as opinions is part of the power of The Citizen. I hope you agree. Attack the points in the article, not the person. Substance over style surely? I am not for one moment suggesting that Vidhi is inarticulate, as you have implied, neither have I attacked him personally. I accept that we all have different styles but the key priority, regardless of one’s style, is to engage the reader. I look forward to reading the second section of Vidhi’s article. As per James’s comments, I hope this is more engaging and challenging. Mario, you are falling in to the trap that you so readily accuse others of on twitter. I, for one, don’t know Bieneosa’s politics and frankly don’t care. I don’t know her politics – I don’t care about it. I wasn’t referring to her! Not sure I therefore understand your comment Paul! Thanks for responding to my comments, James. I understand you feel under attack and I don’t wish to add to it. I do, however, think you are wrong on this one. I am sorry. Just catching up with all of this after spending three days solid promoting Croydon at a trade fair . Sadly, not much of the new business I hope we have attracted this week will be coming West Croydon’s way. I live not far from London Road and we are still waiting, nineteen months after the riots, for the much-talked of investments and improvements to materialise. I welcome any development which is likely to bring these forward. We will believe it when we see it. and debate, which was the whole point of writing the piece. will be a key gateway to the new town centre in a few years’ time. of you for reading my piece and responding. Could you give us some more details of the Royal Mansions scheme? (A while back I saw an artist’s impression of new buildings in the style of the old, but I can’t find it now.) What’s the timescale likely to be on this? To your other points… as you know, I’m one of the people who’s been speaking about the positives of London Road, but I don’t agree that we should focus solely on the positive — problems don’t go away by being ignored. I also don’t agree that regeneration in the town centre will necessarily benefit the less well-funded parts of the borough to the same extent as the same money would have done if spent directly in those areas. What evidence are you basing this assertion on? I don’t have a problem with the clearly signposted political partiality, but the elephant in the room here is the continuing growth in ‘ distress credit providers’, wanted to try to avoid calling them loan sharks. If anyone can explain to me how they are making a positive contribution to the diverse streetscape of London Road please do.